This past Sunday was Valentines Day and Daytona! Sure Valentines Day is fun but Daytona took priority this year. Price and I take NASCAR very seriously. I used to hate it but now I love it and will even fight with strangers in a bar about it. (Yes, it is a sport and I won the argument). So everything revolved around watching the race. So when I saw a Hot Chorizo Dip posted on White on Rice Couple I knew that I had to try it for Daytona. While our favorite Kasey Kahne #9 crashed at the end we still enjoyed the logest Daytona in NASCAR history… 2 red flags created a long race and extra racing made it 520 miles. My misadventures (like showing up to a mall an hour and a half before it opens for Pricer’s Vday present, what mall opens at noon??) on Sunday morning finally brought me over to Whole Foods which was another let down. No fresh chorizo. However a butcher there made things a bit better by explaining what Chorizo is and how to substitute it. So I went for the hot italian sausage and was told to add more heat to get it more like chorizo. Now I should note that I dislike most sausage because of fennel. I zero in on it and can’t get it out of my mind but I forged on and got it hoping to get past my aversion. The dip came together well. It was easy and had a great result. The heat in both temperature and spice was a definite plus! We made a small batch using 8 oz of sausage so if you want more then double it or quadruple it. We polished it off since I did not have breakfast and this became our lunch, plus it is highly addictive. Great for a party or to just hang out and watch a game or some NASCAR. 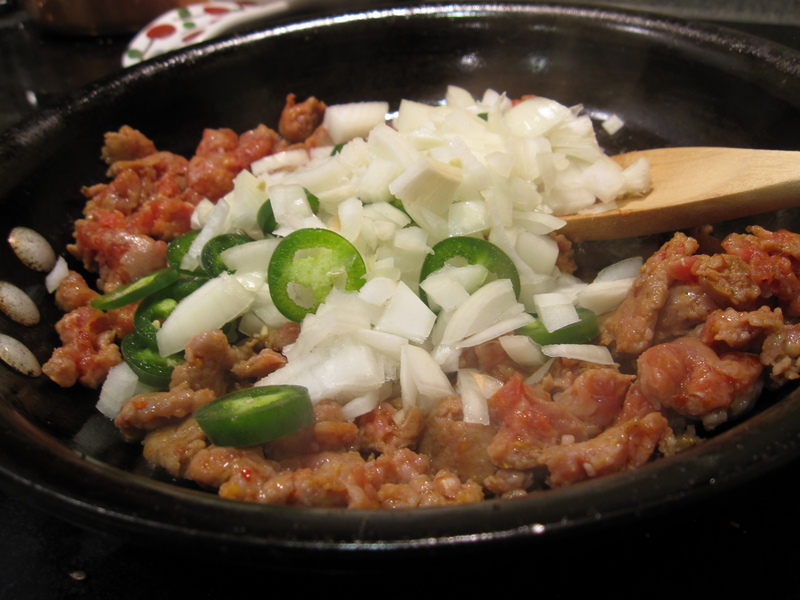 Dice your onion and slice the jalapeno and set aside. Mix together your mayo and cream cheese, set aside. Remove the casting from the sausage prior to cooking. 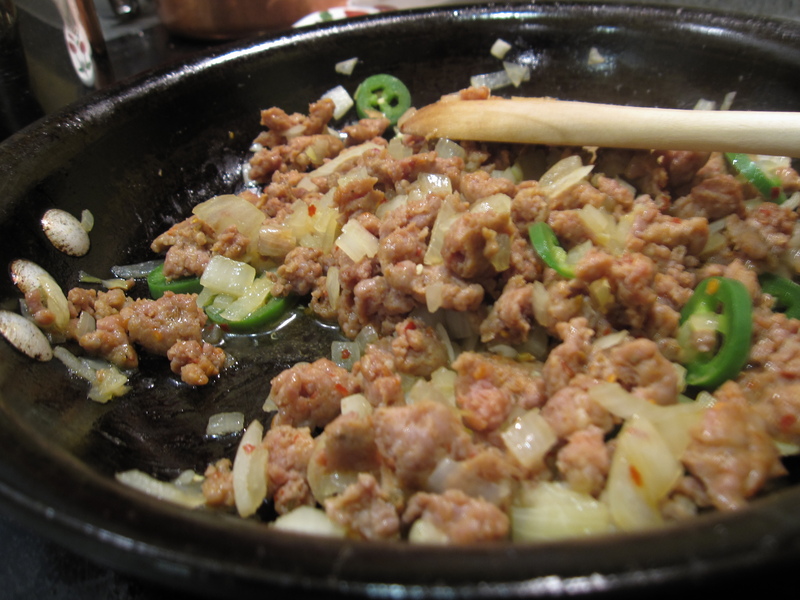 In a skillet on medium, break apart the sausage while cooking it. After a minute add the onion and jalapeno. Continue cooking on a lower temp and breaking part the sausage until the onion has become translucent. 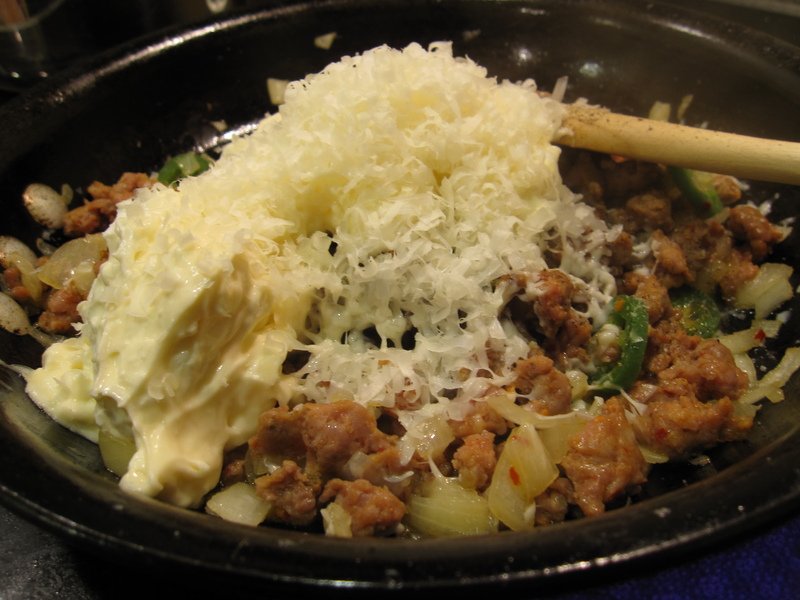 Once the sausage, onion,and jalepano has come together and cooked add the mayo/cream cheese mixture. Mix together throughly. Add the parmesan cheese over the dip. Put a heaping pile of chopped cilantro over the top of the dip. Serve with tortilla chips. I wasn’t sure what I was looking at but after I read further, it looks like something I would like to try. Omg I can’t wait to make this one! 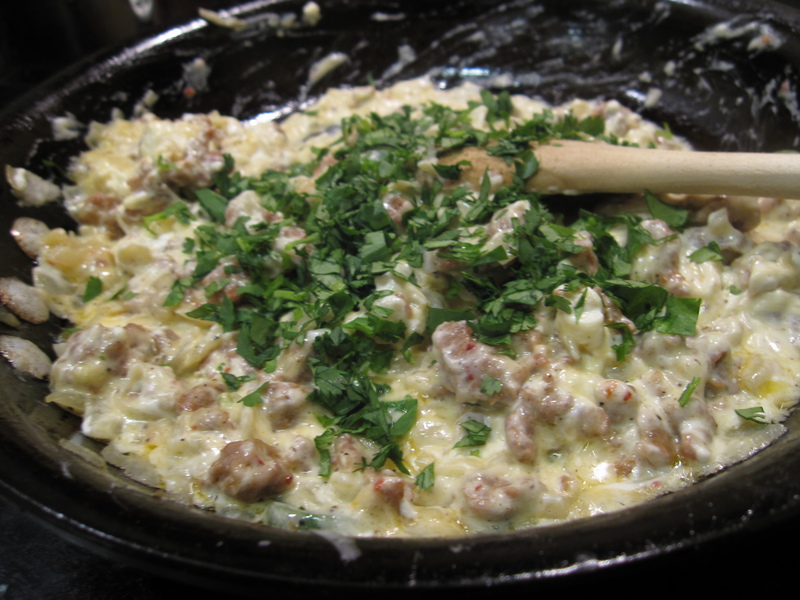 Sausage dip is my favorite but it’s always with cheddar (or Velveeta – gag!). I’ve never seen a Parmesan version. you have to make this! it’s amazing! Everything I’ve made from White on Rice Couple is amazing.